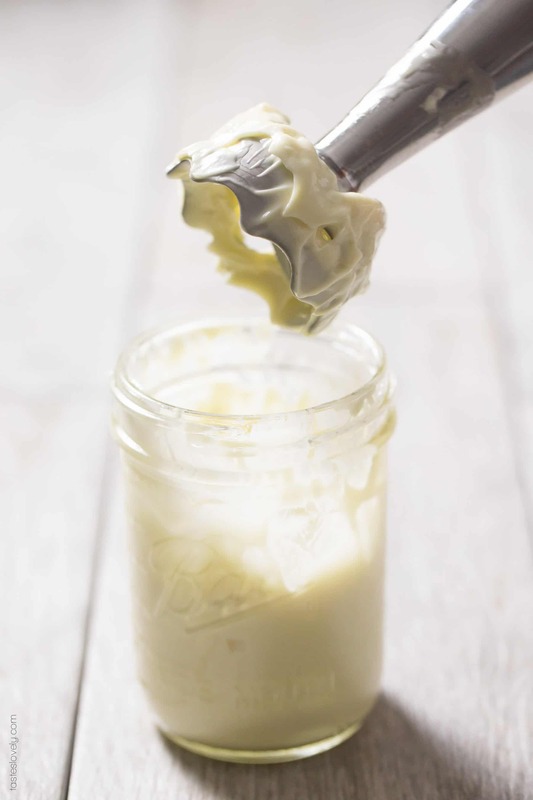 The easiest 3 minute homemade paleo and Whole30 mayonnaise recipe, made in a mason jar with a hand immersion blender. 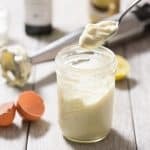 This paleo and Whole30 approved mayo is guaranteed to turn out perfect every time, it will not break. It tastes amazing, and is so much healthier than store bought! Now that I have made this homemade paleo and Whole30 mayonnaise, I will never buy mayonnaise at the store again. This is so much easy! I can honestly make it in 3 minutes. You just need 5 ingredients you already have in your kitchen, a hand immersion blender and a wide mouth pint size mason jar. 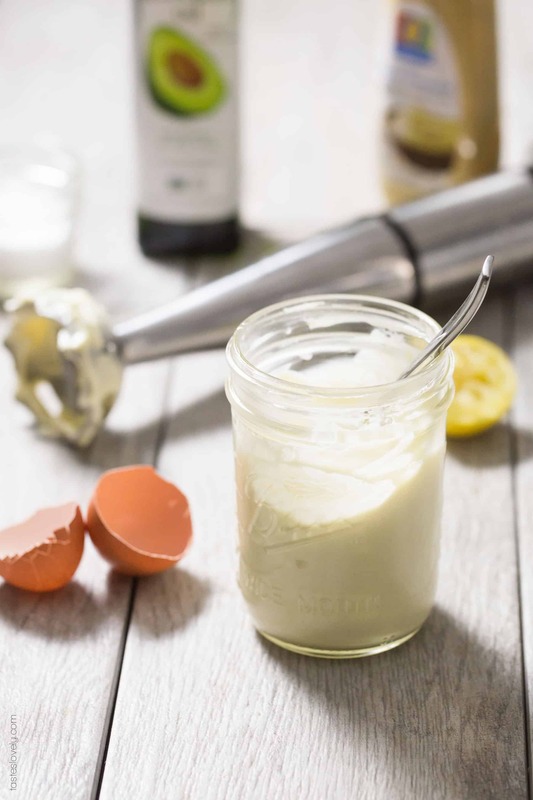 The key to this mayonnaise is the wide mouth pint size mason jar and immersion blender. This won’t work with a regular mouth size mason jar because the opening is too narrow for the immersion blender to fit in. You put all the ingredients in the mason jar, then insert the hand immersion blender. When you turn on the immersion blender, the container is perfectly sized to allow the ingredients to move around just enough to get super whipped and emulsified. You leave the immersion blender on at the bottom of the jar for a good 20-30 seconds before moving it. You’ll see the egg and oil emulsifying and turning white. Then you slowly lift up the immersion blender to continue emulsifying, and within a minute or 2 you have a jar of fresh, delicious and ultra healthy paleo and Whole30 mayonnaise! And the best part? You store the mayonnaise in the jar you just made it in! Which means virtually no clean up. I just have to clean off my immersion blender. I’ve tried making this in my high speed blender before (love my Vitamix! ), and it does work. But it is such a pain to scrape all the mayo out from the blender. It ends up getting all over my hand, and I feel like I can’t get all of it out. I hate wasting all this tasty mayonnaise. The mason jar and immersion blender is definitely the way to go. Does Homemade Mayonnaise Taste Good? We’re both picky about our mayonnaise. Before, I only bought Best Foods. When I’ve tried to save money by buying the generic brand, he could always tell, and refuse to eat it. But his homemade paleo and Whole30 mayonnaise? He couldn’t tell and ate his whole sandwich. And this was a chicken salad sandwich where mayonnaise is crucial! If it passes the husband taste test, you know it’s good. 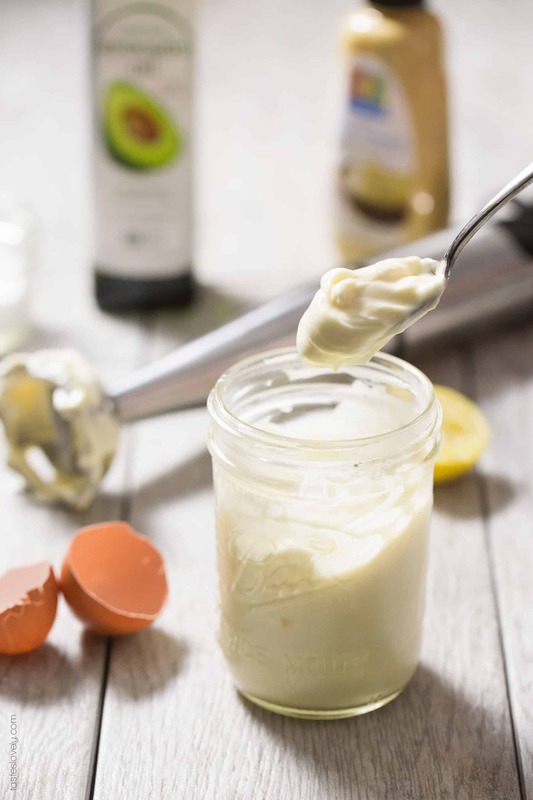 I’ve updated this recipe from my original posting from January 2015 because I now have a preferred oil I like to use in this homemade mayonnaise, avocado oil! Avocado oil is very light and neutral tasting, so it keeps it a mild tasting mayonnaise, which is just how I like it. It is much closer to soybean oil, which is what a majority of store bought mayonnaise’s use. I buy my avocado oil in bulk at Costco so it’s really affordable! Before, I used extra light tasting olive oil when making this mayonnaise. While it was good, it wasn’t…great. Even though the extra light tasting olive oil was milder tasting than regular olive oil, it still gave too much of an olive oil taste to the mayonnaise. 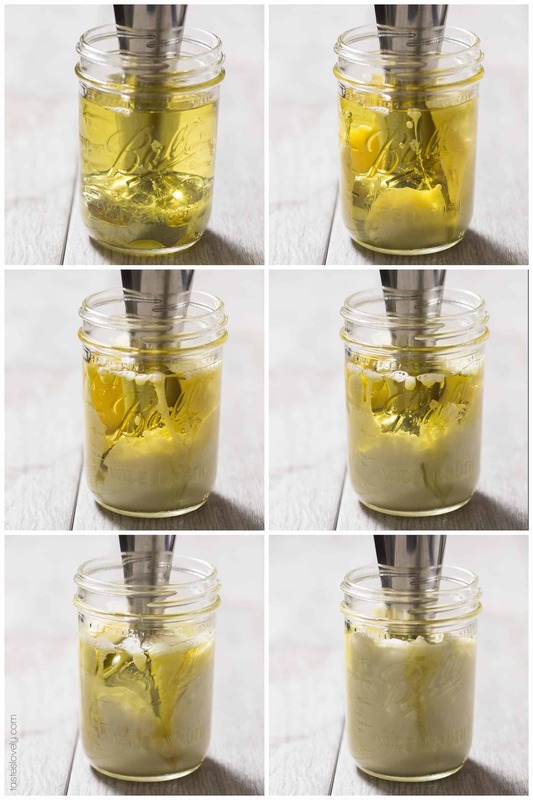 If you like a stronger tasting mayonnaise, give the extra light tasting olive oil a try! 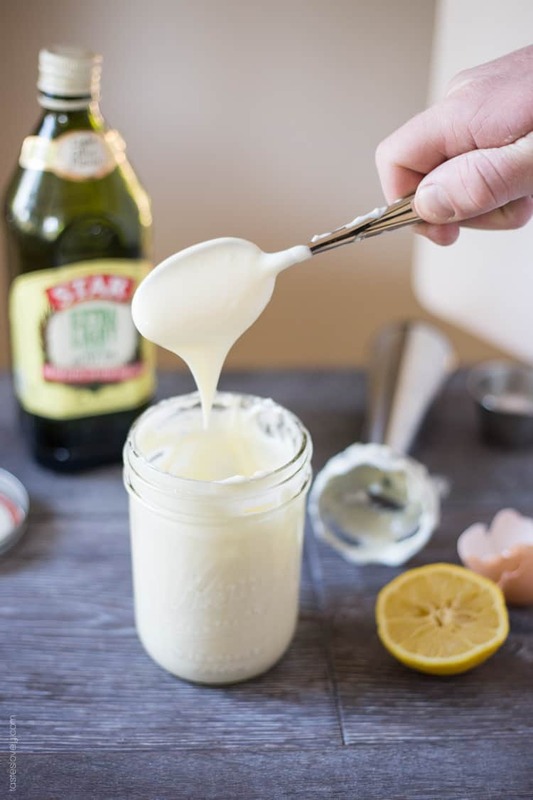 Be sure to use organic eggs when making this homemade mayonnaise. The fresher the egg you use, the better this mayonnaise will be. I use eggs from my chickens. Most of my chickens lay large size eggs, which is what this recipe calls for. Some of my girls lay smaller eggs, so if I use those I’ll use 2 small eggs and 1-1/4 cup avocado oil. If you don’t have chickens, you can get ultra fresh eggs from your farmers market! I like my mayonnaise on the thicker side. That is what I’m used to from store bought. If you like yours a little thinner, use 1-1/4 cup avocado oil. And if you have extra large eggs instead of large eggs, you may need to use 1-1/4 cup avocado oil as well. If you’re unsure, just start with the 1 cup avocado oil. If when it is done emulsifying, it is thicker than you prefer, you can add in an additional oil and use the immersion blender to blend it in. In a wide mouth pint mason jar, add all the ingredients. Insert the immersion blender all the way to the bottom, trapping the egg yolk within the blade. Blend on high. Leave the immersion blender on the bottom for about 20-30 seconds, until the whole bottom is white. Then slowly lift it up. Continue blending until the mixture has thickened to your desired amount. The whole blending process should take about 1-1.5 minutes. Watch the recipe video to see the entire process in real time. Taste for flavor. Feel free to add more salt or lemon juice if preferred. Store in the pint mason jar. Will keep refrigerated for about 2 weeks. Just check for spoilage. I like avocado oil the best, but have used light tasting olive oil in the past. I find the light tasting olive oil to still have too much olive oil flavor. Avocado oil is very neutral tasting. Use as fresh of eggs as possible. I use eggs from my chickens. Famers markets are a great source for fresh eggs too! I’ve made this with store bought eggs as well, no problem. It is perfectly safe to consume this, even though it is made with raw eggs. If you have a compromised immune system, you can google ways to pasteurize your egg first. Glad you can attest to how tasty it is! I don’t think I’ll ever buy mayonnaise again. This stuff is too good! And so easy to make. 3 minutes? Even I can handle that. Never made homemade mayo but love the simplicity. And who doesn’t want to get rid of all the gross ingredients from the store bought? Exactly, no more unnecessary ingredients found in store bought mayonnaise. You must try it Melanie! Then you should definitely give this recipe a try Renee! I don’t think I’ll ever buy mayo again, it’s just too easy to make! Cheap too. I make this all the time! I’m half way through my Whole30 and this is a staple. I’ll never buy store bought again and the immersion blender method is the only way to go. There are other food processor and blender methods where you painstakingly add the olive oil in a slow drizzle, but they fail. A lot…in other words they don’t thicken up and it’s argh! I’m doing Whole30 right now too! We’re only 1 week in, but I really love it. I feel great, and am fine not having any sugar, dairy or breads. So glad I discovered this, because now I can enjoy tuna too. Isn’t this the easiest way to make mayo? Hope the rest of your Whole30 goes well! So you’re one of those people that takes forever at Redbox! :) Only kidding, Natalie! You’re right, in your defense, no one was there when you started! This mayonnaise looks fantastic! I never even thought to make a homemade version. Love this! So easy too, there’s almost no excuse not to have this in your kitchen! Pinned! Eeek, I know, I know. I was totally that slow poke totally oblivious to people waiting for me. Whoopsie! This mayo is so great, you’ve got to try it Gayle! I did not realize homemade mayonnaise was so easy to make! I can totally do 3 minutes! Love this. OMG! I am definitely making this – I hate buying mayo with all the added stuff. I’ve made homemade mayo before, using vegetable oil. However, I have wanted a healthier version. I never thought to use extra light olive oil! Thanks for sharing! I never really considered how much “other stuff” was in mayo, but now that I’ve gone homemade I don’t think I’ll be going back. You should try the light olive oil Keri! Healthy, and gives it great flavor! I always struggle with mayonnaisee.. mine never turns out as perfect as I would like! I definitely have to try your quick 3 minute version – it looks delicious and perfect too! I’ve tried other methods. Making it by hand in a bowl with a whisk is the worst! But it is quite the arm workout. You should definitely try this 3 minute version next time Thalia, works every time! There’s nothing I like better than a quick and easy recipe! I can totally handle 3 minutes. Were your movies at least worth the wait?? Lol. Don’t worry, until very recently I had never made homemade mayo before either. But now I am hooked! You should give it a try sometime Olivia, so much easier than you think! Love this!! Clean mayonnaise? No way! And your photos are gorgeous!! You go girl! I must try this. I am not a huge fan of regular mayo since I switched to Vegenaise, but I am a huge fan of anythign homemade. I bet it tastes way better than regular mayo. BTW, I stopped receiving an email everytime you post new material. Gotta look into that. I wonder if you could make a vegenaise version? I’ll have to look in to that for you. My mom is vegan, so I know she would appreciate the recipe too. And it definitely tastes much better than regular mayo. And thanks for the heads up on the emails not coming thru! I’ll have to look in to that. I wonder if it’s your email provider? I use Gmail, and my mom uses MSN and both of those are still coming thru. Let me know if you figure out what the issue is friend! 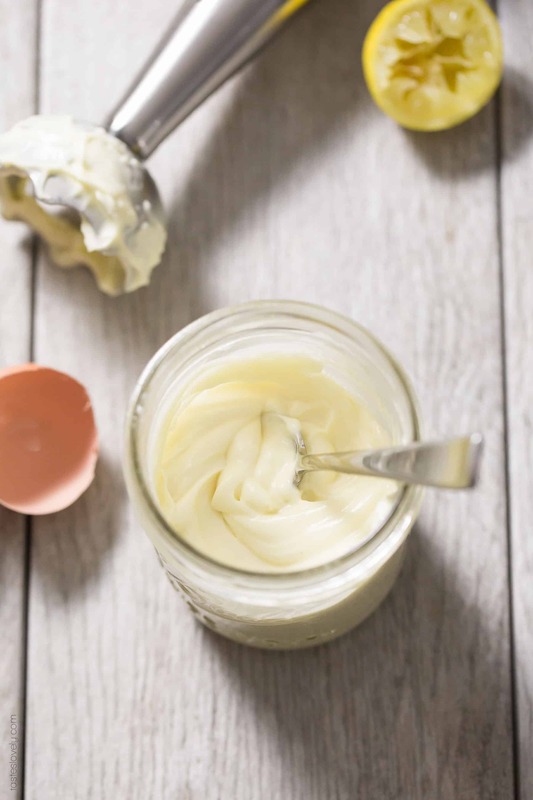 I have always wanted to make my own mayo and I’m not sure I’ve ever tasted homemade! I thought it was way too complicated, but this sounds so easy! I swear by my immersion blender. Comes in handy! This is so cool!! I love making stuff from scratch. It saves money and always tastes so much better. Who knew making homemade mayo was so simple?? I think this definitely saves money! I was lucky and my grocery store had my favorite extra light tasting olive oil on sale, buy 1 get 1 free. So now it’s going to be extra affordable. You should give this a try Annie! If you love made from scratch, this is perfect for you. I’ve actually never liked the really thick store bought mayo .I like my mayo thinner and creamy I usually buy from a restaurant depot nearby but i end up throwing so much away .Your recipes looks like my style of mayo!!Pinned!! The great thing about this homemade mayo is you can totally control how thick the mayo is, depending on how long you blend it. I bet you’ll really like this! wow I never realized that making mayonnaise was this easy! Fantastic, thanks for the recipe! LOL, I hate people like you at RedBox!! Hahaha… at least you didn’t realize though– some people are just plain rude about it! This mayo is SO easy. I need to try it with our quail eggs– quail eggs don’t carry salmonella so they are totally safe to eat raw! Not that I wouldn’t eat a chicken egg raw (I’ve made homemade Caesar dressing before), but it’s nice to have the extra protection just in case! Thanks for the shoutout, Natalie! I used to hate mayo growing up, but now I love it so much I want to put it on everything! I’ve never made my own before though because it has always seemed kinda scary so I love this easy recipe! This sounds delicious! But I wonder how long it would last? Good morning I would just like ask if you put the whole egg and not just the yolk? Morning Robert. Yes, the whole egg (white and yellow). Not just the yolk. Just the yolk are for thicker aiolis. Hope you love this mayo if you try it! So easy! Thank you, just made this..it is good, but I will try adding a little vinegar next time. What blade is best for the blender..mine has 4 different ones. I used two different ones, because it took longer then explained. Which is the correct one? This is my 2nd time using my hand immersion blender. So glad you liked it! Good idea adding vinegar. Great if you like a little more tang. The blade I use is the one that has just 1 big blade on the bottom, with the 2 ends of it pointed and sharp. Hard to explain, ha! Hope that helps! I raise my own chickens for eggs, but our eggs are small/medium-small. Do you think it would work okay if I used two of the smaller eggs in place of the one egg in this recipe? I’m really intrigued by the method for this recipe. I’ve made paleo mayonnaise before (in my vitamix), but it was always too olive-oil-ey for me, so I’m also considering an avocado/coconut oil blend I have instead of the olive oil. Hi Deanna. Sorry for the delay in response. I raise my own chickens too! My eggs are more small/medium size as well. I use about 1/2 cup of oil. Or I’ll use 2 eggs, and 1 cup of oil. And definitely try “extra light tasting olive oil”. It barely has any taste at all. Way different than regular olive oil. I’m not sure how well coconut oil would work since it hardens at cooler temperatures. But avocado oil would be great too! Maybe the size of your egg is smaller? So it’s not emulsifying and getting thick enough? I would try cutting back on the amount of oil a little bit, and see if that allows it to get to the correct thickness. This has to have a lot of calories though with all the olive oil, right? It depends on the olive oil you use. You can calculate the calories on caloriecount.com with the ingredients you use! I have attempted to make mayo on several occasions with a blender & failed. This is so quick ad easy. I just make more for the 2nd time. I use it on deviled eggs & I am getting ready to make a creamy cole slaw. Thanks so much for this recipe. I do have to say that I use Avocado Oil instead of Olive Oil. I like the taste better. So glad you like! Great uses of them. And I have to try avocado oil! 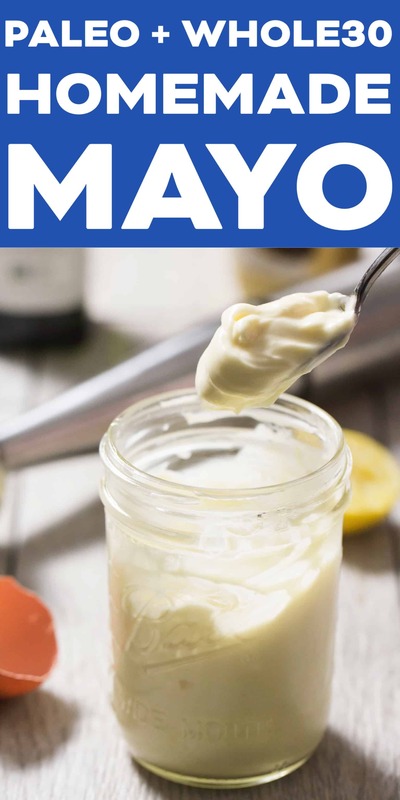 I have made this mayo lots of times and it comes out great, except when I do exactly what I have done every other time and it doesn’t emulsify!! Anyone else run into this problem? My daughter also makes it and has had the same problem, but only once. It stays a liquid – how can that be???? Are you using an emulsifier? Hmmm, maybe the egg isn’t fresh? Are you doing it in a mason jar? I’ve made this with the Olive Oil & half Olive Oil & Avocado Oil. Just don’t like the taste. I love olives, but not the taste of the oil. I just made another batch. Only Avocado Oil & the juice of a whole lemon. The best one I have made. I have to try that now! Avocado oil is really healthy too. This is also very good to add Wasabi for fish dishes. Isn’t it amazing how great it works? And yes, you can play around with all sorts of different oils. I, personally, wouldn’t use the kanola/corn oils. Not healthy oils. Hi, I don’t have an immersion blender. Would it work to use one of my cups with my ninja? Hi Amy, I haven’t tried that, so I can’t be sure. I know this works because of the small space where everything mixes, so a small cup with a Ninja might work. Give it a try and see! Buy an immersion blender. It’s small & not expensive. You can also use it to make sauces. This recipe is pretty simple, but so delicious! I love homemade mayo! I’ve made mayo before and this def did not work. I ended up with a soupy mess. I Won’t make again. I’m so sorry you had trouble with it. I make a batch of this mayo at least once a week and it always turns out perfect. Did you use a wide mouth mason jar? You have to make it in a container that is barely larger than your immersion blender so that the mixture gets properly emulsified. Let me know if you need help troubleshooting the issue! My immersion blender is just a little bit smaller than my jar and I used a large room-temperature fresh egg. The mayo never emulsified or even thickened. I even added an extra yolk and blended for three more minutes…nothing worked. Help! What kind of immersion blender to you have? I have this Cuisinart one and it works great! https://amzn.to/2KKuwdB Try using a wide mouth pint size mason jar, that’s what I use and it always emulsifies. Did you watch the recipe video in the post? It’s exactly how I make it, and it turns out great every single time. You could always take a video on your phone of you making it and email it to me and I’ll see if I can pinpoint the issue too! Same here I’m here at 8 mi utes right now using the cuisinart immersion blender,,,,, watery very watery. And my blender almost burnt out I am taking a break from it lol. Oh no! Sorry you’re having issues with it! Let’s see if we can figure this out. Are you using a wide mouth pint size mason jar, like this one? It should be JUST enough room for your immersion blender to fit in. It won’t even work in a quart size wide mouth mason jar, the inside is bigger. It has to be the pint size one. It needs to be a tight space so the ingredients get really whipped and can whip up correctly. Are you using a large or extra large egg? If you’re using a smaller egg, use less avocado oil. Maybe the ratio is off for the size of your egg and there is too much oil for it to whip up. Or just try using less oil. A few of my chickens lay smaller eggs, and when I use those ones I only use about 3/4 cup of avocado oil. Is your egg fresh? If it’s too old, maybe it won’t whip up right. I only use fresh eggs from my chickens that was laid within the past few days, so I don’t have a ton of experience with store bought eggs. Those are the first few that popped in to my head. Let me know if any of those help, otherwise I’ll keep thinking of what the issue could be. You could also take a video of you making it and email it to me! Then maybe I can spot the issue. Hope you have better luck with it! It is so good, I haven’t bought mayo in years once perfecting this recipe. Can’t get it to thicken up. Help! Made it once perfectly. 2&3 bombed. Oh no! Sorry you’re having issues with it! Are you using the immersion blender on high speed? Are you using a wide mouth mason jar? Or a jar that is BARELY bigger than the immersion blender? It needs to be a tight space so the ingredients get really whipped and can whip up correctly. Those are the first few that popped in to my head. Let me know if any of those help, otherwise I’ll keep thinking of what the issue could be. Made it tonight – turned out amazing! Have tried the food processor recipes before and they don’t always turn out. Another tip for some folks is to have the egg at room temperature. I tried that today with this recipe and it worked perfectly. This is my 8th attempt at making this. The same every time. I follow the directions and fail. I have a Calphon immersion blender that just fits in the Kerr quart size jar. I tried less oil and I have large eggs and have tried XL eggs. I am at a loss here any ideas Please. I’m so sorry you’re having issues with it! Let’s see if we can figure this out. It looks fabulous but you should know that any and all oils are very bad for your health. The problem lies with the fact that all oils are in the process of oxidizing and you have very little way of know how far along in the process the oil has gone. Oils oxidize even without heating and when they are in contact with oxygen, in the air, they become the catalyst for free radical production. Free radicals cause damage to other living cells, proteins, and DNA. They start off a chain reaction that quickly grows out of control causing damage that leads to a range of diseases and causes the symptoms of aging. Oils of every kind, along with foods preserved with nitrates and nitrites, like bacon and deli meats, are why everyone is so sick, why longevity rates are declining, and why more parents will bury their children in the coming years. Calm down Patricia. You’re aging right now as you type. Free radicals happen from almost everything in our modern world, even working out. Let’s just relax and enjoy some mayonnaise for crying out loud. This is AMAZING! I can’t believe how easy it is! My KitchenAid immersion blender ($30 from Amazon) came with its own blending cup, which worked perfectly! I’d stopped eating chicken salad, tuna salad, even deviled eggs because the thought of all that soybean oil in Hellman’s (same as Best Foods, just different regional branding) made me sick, so I am thrilled to pieces about finding this! (I’m eating chicken salad as I’m typing.) I also buy my avocado oil at Costco… literally half the price of other grocery stores. Sooooo much cheaper than the commercial avocado oil mayo’s (assuming you buy the oil at Costco). Thank you for the recipe and technique! Yea yea yea! So glad you like it! And smart using their blending cup. Even easier! And I get my avocado oil at Costco too! Best price I’ve found. I’m seriously making 1-2 batches of this mayo a week, so we go through a lot of avocado oil. Thanks for all your compliments! This made my DAY! Also it says that this keeps for 4 weeks? Other recipes say 4 days. This is the easiest and best recipe I’ve ever used for mayo. I made this in two minutes. Delicious and perfect. I will never buy mayo again! I’m so glad you liked it Lia! You made my day! I haven’t bought mayo in years since perfecting this mayo recipe. Yea! I’m so glad you like it Niki! You have to let me know how it is with hemp oil, never thought to try that one. Big hugs! Ok, I am definitely not a cook. I’m sure this is pilot error. Can you help me figure out what went wrong? I did exactly as described except that my pint mason jar was shorter and wider, with a wider opening. I used a Cuisinart immersion blender (same head as yours), though it’s old. It has 5 speeds and I used #5. I tried adding an extra yolk and that helped a little, but not much. On the other hand, I was making egg salad and adding a couple of teaspoons of this liquid worked, from a taste perspective. I’m sure it’ll be yummy if I can get it right. I have someone in the house who can’t eat raw egg. Can I substituet pasteurized egg whites or some other sort of pasteurized egg product? PS I’ve been making my own mayo according to essentially this recipe for years, and it’s delicious. I like to use half coconut oil to give the mayo a subtle coconut flavor (why half? Because if you have all coconut oil and you put it in the fridge, you will have a solid block of mayo instead of an emulsion). I’m not sure pasteurized egg whites would work. Are they cooked egg whites? Hmmmm. Maybe try searching for a homemade vegan mayo, since that won’t have any egg in it. I’ve never thought to use coconut oil! I’m going to have to try that next time! Wow this was so easy and tasty. This was my very first attempt at making homemade mayo and I killed it, Lol!! I’m 63, so I’ve been in a kitchen for a very long and always thought that making mayo was for the good people at Best Foods. I am eating Keto and could not find a mayo that didn’t have ‘the forbidden oils’ in it. I love the jar and immersion blender idea it worked out so well. Thank you! You just made my DAY! So glad you liked it! Big hugs! I tried this recipe expecting it not to work….but I was AMAZED! It’s delicious! I make it once or twice a month. My husband and son love it! I’m so glad you liked it Laura! Thanks for letting me know. You made my day! This is a great recipe for a good healthy Mayo. This was so easy, I am impressed. I am a 65+ year old guy not familiar with things like this. I read a lot of Mayo recipes before I found this one. I thought it can’t be this easy. It was! The hardest part for me was getting a wide mouth mason jar. the rest was easy. Natalie, keep up the the good work. Yea yea yea! So glad it worked for you Ron! I haven’t made mayo in years since perfecting this recipe. Thanks for letting me know you liked my recipe, you made my day! The first 2 times I made this it totally failed. Both times my mayo came out like a soupy dressing. The first time, I think I lifted the blender too slowly and it just turned everything to liquid. It had started whipping up, then just liquefied. The second time, I tried to make it in the mayo container and it never even whipped up. So, I tried it, again, and used a stainless mug that is only just wide enough for the blender to fit into the bottom. (I don’t have any Mason jars, yet.) I lifted it out as I saw the oil turn white and whip up around it, keeping just slightly ahead of it. That worked wonderfully. I was able to get the next 3 batches whipped up in no time. It took only about 20 seconds (30 at most). This is now my go-to mayo recipe! Yea! So glad it turned out! It’s *so* important that the jar you’re using is barely larger than your immersion blender. Otherwise the liquids have too much space to move around and they won’t emulsify. Glad you stuck to it and finally got it to work. Isn’t it so great? I haven’t made mayonnaise since perfecting this recipe years ago. Thanks for letting me know you liked my recipe, you made my day! First time trying to make homemade mayo. It turned out AWESOME! I used half apple cider vinegar, half lemon juice, avocado oil and a large farm egg, cold out of the refrigerator, (and it wasn’t a fresh one). So easy and delicious! Thank You! I stumbled on this recipe in searching for GF/DF Mayonnaise. I just tried it and followed the recipe to a T using avocado oil. I’m very very happy with the results. This is quite delicious and so much better than the store bought stuff. I’m trying desperately to find substitutions for everything and this one is a keeper. Thank you so much for sharing! I have made this 5 times. The first 3 times it was perfect! But last 2 times it was fluid and did not emulsified… I did not change anything! What could be wrong? Maybe the egg was too old, or too cold? Oh darn, so weird it didn’t work the last 2 times. Maybe the egg is too old? The fresher the better. I’ve made it with cold eggs in a pinch and it still worked, so I don’t think that’s the issue. When you put the immersion blender in the wide mouth mason jar, is it right over the yolk? And is the immersion blender pushed all the way to the bottom of the jar to “trap” it? That’s how a majority of the emulsification occurs. If you keep having issues you can take a video of you making it and email it to me! I’ll see if I can spot what the issue is. I made this mayo tonight for our whole 30 chicken salad. Oh wow! My husband and I looked at it like it was magic as it immediately turned into mayo. Thank you! Yea! So glad it turned out for you Amanda! This made my day! It is kind of like magic, right? So satisfying watching it emulsify. Thanks for letting me know you liked my recipe! Do you have nutrition information and/or macros? You can calculate all the nutritional info on myfitnesspal.com! I noticed in the recipe list you have Dijon mustard added…. I watched the video and never noticed th mustard going in. When do you add this? When you add all the other ingredients! Just add it all to a mason jar, put in the immersion blender, and blend on high for about 1-2 minutes SLOWLY lifting the immersion blender while it’s blending. Works like magic! What a great recipe, Natalie! I have Hashimoto ‘s disease and need to stay away from any soy products, so it’s better for me to make my own mayo, where I control ingredients. Most store mayos use soy oil. So, this recipe has been a God send. A few changes I’ve made is using only the egg whites from two eggs for lower cholesterol version and 3/4 cup avocado or grapeseed oils. I also pasteurized my eggs with a sous vide and would highly recommend doing so as raw eggs could have harmful bacteria in them. I set the temp on the sous vide at 135°F for two hours. The eggs will get slightly thick and start to turn a little white at that temp, but work just fine for making this recipe. All in all, it is a perfect recipe and method and I’m so grateful to you for sharing! One other thing I forgot to mention. I added some Bragg’s apple cider vinegar with the lemon juice and about a teaspoon of raw honey. I was thinking these may help with preserving it a little longer and are good for but health. Yes! Great additions! I want to try this next time! This was all so interesting to read! Never thought to sous vide the egg whites, or cook it with only egg whites. This is a great option for those with compromised immune systems who want to keep it extra safe. Thank you for sharing Susan! This recipe is so cool and delicious! My only complaint is that it’s a little bit too rich from all the oil. I reduced it to 3/4 cup and it still way too rich, so I’d recommend a little less than 3/4 cup for people who don’t like such rich Mayo. Either way this was an amazing recipe! Glad it worked for you Bree! I reduce the oil sometimes too, especially when I’m using an egg from my chicken which is smaller than the large store bought eggs. Great tips! Big hugs! Thank you for this recipe! The video is so nicely done and the recipe is neatly set out. Greetings all the way from South Africa! Glad it turned out perfect for you Tindie! That makes me so happy! Big hugs all the way from California! Appreciate you reading my blog, making my recipes, and letting me know you’re enjoying them! I used ground mustard and a truffle sea salt from my favorite spice vendor instead of dijon mustard. It’s so easy and delicious. That sounds delicious! I want to try that next time! So glad you liked it. Thanks for letting me know! Wonderful! Due to heart problems, I have had to start making my own condiments. I found this recipe through Pintrest, and bought an immersion blender, and within 5 minutes of getting it home, I had mayo! Great and easy recipe, thanks! So glad you found my recipe! Isn’t it the best mayo ever?! The immersion blender method is the way to go! Rooting for you and your health journey! I love this mayo but the last time I made it I tried to use ground mustard and it would not thicken! Why? I’m so sorry it didn’t work for you! In the recipe notes I have listed a lot of trouble shooting tips, as well as a recipe video within the post so you can see exactly how it is made. Hope these help! You can always email me a video of you making the mayo and I’ll see if I can pinpoint the issue. Looked for a mayo recipe and very glad I found yours. My new alternative Dr. set I must go Paleo. I have missed tuna salad so much and looked for an easy recipe. You nailed it! Definitely love the immersion blender. Not real fond of mustard so left it out and was still good. you will not believe this but I do add collard greens to my tuna salad to get more greens. Does not have a strong flavor. Thank you so much! Will be looking at your other recipes to add to my new Paleo diet. I’m so glad it worked for you and you liked it! Such a healthier and better alternative. Thanks for taking the time to let me know you liked my recipe Julie! Oh darn, I’m so sorry Lise! In the recipe notes I have listed a lot of trouble shooting tips, as well as a recipe video within the post so you can see exactly how it is made. Hope these help! You can always email me a video of you making the mayo and I’ll see if I can pinpoint the issue. So glad to hear it Gill! Thanks for taking the time to let me know you liked my recipe! Been through so many Mayo recipes – standing by the mixer putting tiny amounts of oil in to eggs, and usually ended up with inedible goo. I used room temperature eggs as I know that’s affected my mayo before. Thank you Claire! So happy to hear that you loved it! It really is the best, couldn’t agree more! Thanks for taking the time to let me know you liked my recipe. Made my day! Like the previous review, I never liked drizzling oil into a blender and I hated cleaning up the blender. And I think you said you lose a lot in the transfer and all. I just made this without the mustard because I cannot have vinegar and it came out perfect. I followed your directions exactly and even set a timer for the blending part. So easy. Mayo already in the jar. Love it. Might try mustard powder next time for flavor. I thought mayo was out of my life forever cuz they all contain vinegar. Thank you!!! I’m so glad to hear you liked it Becky! Thanks for taking the time to let me know! Do you use a whole egg or just the egg yolk?